There are a significant number of Americans who would love to point the finger at the United States as bearing responsibility for the events of 9/11. This might be as close as they'll ever get. Based on the Pulitzer Prize-winning book, The Looming Tower follows Osama Bin Laden and Al-Qaeda in the late 1990s as their threat rises. At the center of The Looming Tower is the rivalry between the FBI and the CIA and their possible culpability for the tragic events due to an inability work together and share information, leaving the U.S. open to an attack that could have been prevented. 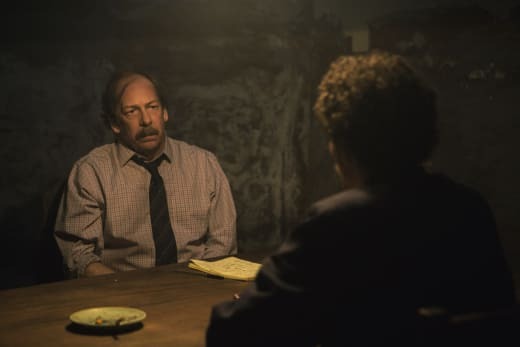 Showrunner Dan Futterman and Executive Producer Alex Gibney have put together a limited series that plays more like a documentary than a fictional take on actual events. Given Gibney's documentary prowess, that's no surprise. 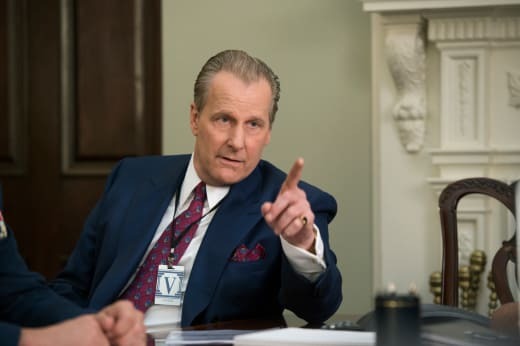 Jeff Daniels as FBI agent John O'Neill, Tahar Rahim as FBI Agent Ali Soufan, Bill Camp as field agent Robert Chesney and Peter Sarsgaard as CIA composite Martin Schmidt do most of the heavy lifting, although the remaining cast is notable and on point. I'm hard-pressed to recall at this point what any of the women did other than those who portrayed wives and mistresses. That shouldn't be surprising given the old boys club nature of government that was still in full force in the last 1990s and the high level of bureaucracy that dealt with terror at the time. Focusing on John O'Neill, we discover he's the leading scholar on Osama Bin Laden and Al-Qaeda leading into and through the major terror plots of the late 1990s and early 2000s including the 1998 United States embassy bombings in Dar es Salaam, Tanzania, and Nairobi, Kenya, as well as the bombing of the USS Cole in 2000. O'Neill, though is a bit of a mess. He likes to play like a made man, a big spender, walking into restaurants where he's known and everyone moves so he can have his favorite table. He enjoys what he considers the perks of the job, but it also makes him somewhat of a joke despite the intelligence he has at his fingertips. 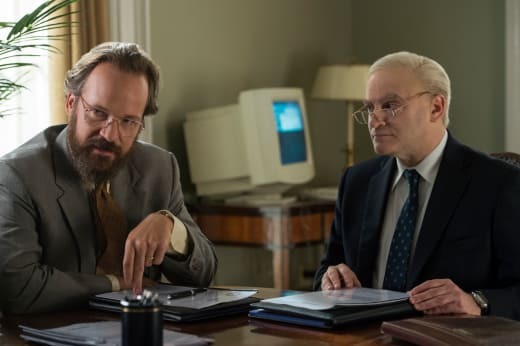 O'Neill's personal life is given a lot of room to breathe on The Looming Tower, and it's hard not to see how it must have gotten in the way of his professional life. A wife and family and multiple mistresses over the years, his schedule seemed impossible to fathom adding only more stress to an already stressful position. He was never able to relax. Being on call 24/7 made lies easier to juggle, but that meant the world was falling apart around him. He fought hard to keep his counter-terrorism division of the FBI in the game when it seems it would have been easier for someone who was thought of more highly in the bureau. Through it all, Daniels gives O'Neill an air of authority -- and dissatisfaction that it's overlooked -- on a playing field where he is obviously thinking ahead of the pack. the ease with which Daniels' naturally swings between easygoing scenes leading O'Neill's team and the tension-filled rooms with superiors when his expertise is questioned highlights O'Neill's humanity, love of country and his work. Camp does a great job showing how a veteran FBI agent could take interrogation techniques learned on a different beat, in his case domesticated organized crime, and transfer them to successfully extract information from suspects around the world. This marks the fourth television role for Camp that has been out of this world, after The Leftovers, The Night Of and Manhattan. He has a nose for these parts. The composite CIA agent played by Sarsgaard feels like a typical CIA agent on steroids. He's set up as the antagonist to Daniel's protagonist, even though both are highly flawed. It's only because we see the more of O'Neill that he doesn't seem a stubborn as Schmidt. As representatives of their respective organizations, they aren't the best selling points. But O'Neill hired Ali Soufan, one of the eight Arabic speakers in the FBI as his right-hand man, and that move lifts the man. In part, it's due to Soufan's portrayal by Tahar Rahim. He's eager to please and appreciates the position he's in, and even if at first he realizes his spoken language has earned him the role, he takes advantage and offers much more to the operation. The Looming Tower could have been made with a political angle. In lesser hands than Gibney's, someone might have tried using the material to speak about an agenda. But for at least the first three episodes of The Looming Tower, that's not the kind of storytelling utilized. It's factual and unbiased, allowing the viewer to draw their own conclusions from what they see rather than forcing an opinion upon them. Ironically, that almost makes it more difficult to watch. Fighting over 9/11 and its cause has become a security blanket of sorts, a way to think about it without admitting we've never really wrapped it up with a nice little bow. 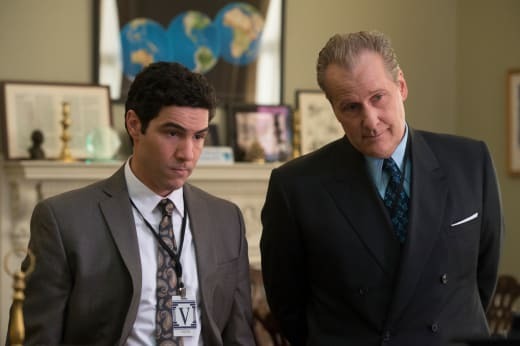 Watching The Looming Tower, you're right back at that point in history, watching it all tumble down again struggling to understand how and why it happened. The Looming Tower stars Jeff Daniels, Peter Sarsgaard, Tahar Rahim, Annie Parisse, Wrenn Schmidt, Michael Stuhlbarg, Bill Camp, Sullivan Jones, Virginia Kull and Louis Cancelmi. The Looming Tower premieres Feb. 28 only on Hulu. Nico: I was actually scared of that Staff. Karolina: Maybe your darkness is you. Your power. Like, how my light is for me. Permalink: Maybe your darkness is you. Your power. Like, how my light is for me. Victor: Everything we’ve built is for the next generation. For you. Chase: I told you, I don’t want anything to do with PRIDE. Catherine: It’s true, we have done many things that we’re not proud of. Robert: Under duress from Jonah. Tina: And nothing we say or do will bring those kids back. Stacey: We’ve all done a lot wrong, but we did one thing right: you kids. Dale: Well, and a genetically engineered dieinonychus, just to say it. Catherine: You can use PRIDE’s resources to make up for what we have done. Geoffrey: Think of it. With all this money, tech, power, you could change the world. Chase: And I’m supposed to believe that, what, you’re all just gonna walk away from this? Permalink: And I’m supposed to believe that, what, you’re all just gonna walk away from this? 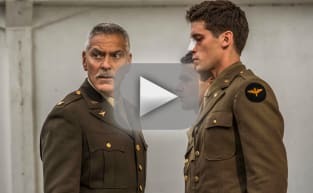 Catch-22 Teaser Trailer: There's No Way Out! !